Transportation of overloads of stones-sands from Bhutan to Bangladesh through lower Assam districts like Kokrajhar, Chirang, Bongaigaon, Goalpara, Kamrup (Rural) and Barpetadeceiving taxes continues since long. This came to light after seizure of 10 over-loaded dumpers including one from Bhutan on the National Highway 37 during an operation carried out by a team led by a forest official under Goalpara Forest Division. It may be mentioned that few years back, an agreement was signed between India and Bhutan for transportation of stones to Bangladesh through lower Assam districts like Kokrajhar, Chirang, Bongaigaon and Goalpara. On the basis of that agreement, stones have been transported from Bhutan to Bangladesh through the Indo-Bangladesh border in Meghalaya. Import-export of natural resources and other things is done between the two neighbouring countries on the basis of the ‘Free Trade Agreement’ signed between India and Bhutan. This agreement was renewed in 2016 in the month of November and it was implemented from the month of July, 2017. On the basis of these two agreements, more than hundred dumpers continue to transport stones day and night. But most of the dumpers carry overloads and deprive the country of the taxes levied. In such a situation, an operation team of the forest department was able to seize 10 dumpers on the National Highway near the Naranarayan Setu. 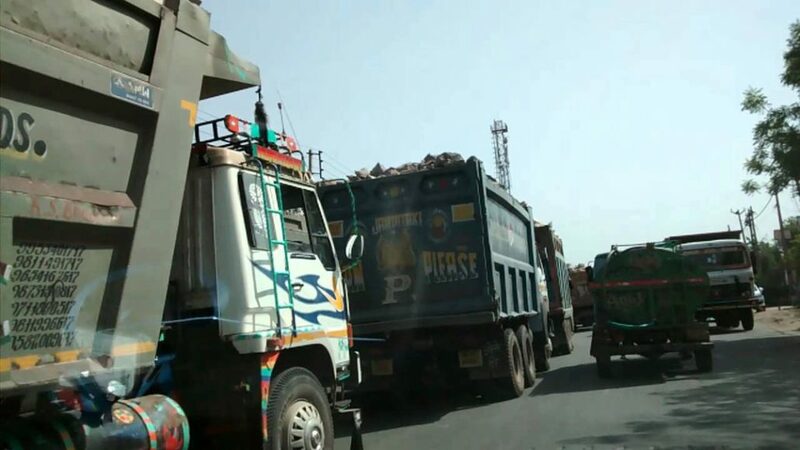 The registration numbers of the seized dumpers are BP1-A-1996 (Bhutan); AS16-AC-1984; AS19-AC-1433;AS26-C-5892; AS26-C-6278; AS26-C-5988; AS19-AC-1434; AS16-AC-0605; AS26-C-5201 and AS26-C-4975. According to sources, a total of five business establishments including one owned by stone trader of Bangladesh named as Mobarak have been transporting overloads of stones and sands day and night through the corridor of Bhaluk-Genengphu. Though the dumpers carry 20-22 tonnes of stones and sands, they make challans for only 10-12 tonnes. This way the country lose huge amount of taxes. There has also been allegation that some dumpers carry loads for a week with one challan. Currently, 50-60 dumpers of Mobarak’s establishment carry sands and stones, say sources.